Famed overclocker 'der8auer' has managed to overclock the new AMD Ryzen 7 2700X to cross the 6 GHz on all cores. He managed to achieve this by first selecting the best CPUs for the task and then subjecting them to LN2 cooling. Consumer use isn't anywhere going to get close to that figure but it is still good to know that Ryzen are really as overclocker-friendly as AMD claims. Overclocker populaire 'der8auer' has done it once again. 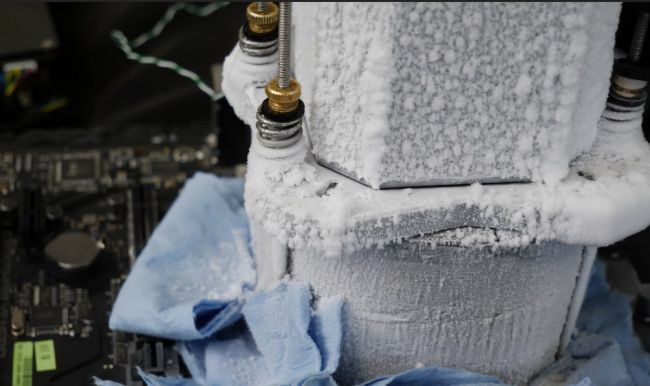 He has managed to overclock the recently announced AMD Ryzen 7 2700X CPU to a whopping 6,009.34 MHz using liquid nitrogen (LN2) cooling. The best part of the feat was that he was able to achieve it on all 8 cores. In order to achieve such high clocks, 'der8auer' first started by selecting CPUs that can stably overclock on air cooling — a process called binning. Binned CPUs then are placed on the Asus ROG Crosshair VII Hero motherboard that sports the new X470 chipset. This was important as the X470 comes with support for Precision Boost 2 and XFR 2 technologies that allow for opportunistic overclocking potential. In order to ensure that the motherboard accommodates the considerably huge LN2 canister, 'der8auer' stripped the non-essential components around the CPU socket such as some of the heatsinks and decorative shielding. To prevent condensation of the LN2 vapors on the motherboard, heated vaseline was applied around the socket area on either side of the board. Despite reaching 6 GHz on all 8 cores, the Ryzen 7 2700X was still not able to beat the Core i7-7820X, which still holds the record at 2,739 points but it did manage to come close at 2,627 points. While such setups are highly impractical outside the tiny enthusiast overclocker's realm, it still is good to see just how far can AMD's new offerings go. Check out the video below for an interesting look at the how the whole setup was created.